Old Siam is the land that became the mysterious source of exotic spices during the Age of Discovery, when expeditions of European ships plied back and forth with their precious cargoes. Now Thailand is a Dream Destination for visitors of another kind, who are in search of life in the slow lane on one of its hundreds of glorious beaches. And it’s not just about beaches. 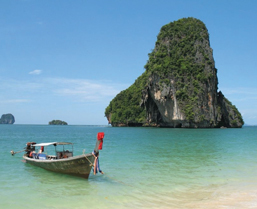 Thailand is a place of tropical rainforests, mountains and spreading plains, with a bustling capital city at Bangkok. The country’s mountainous north is famed for its profuse orchids and its ethnic crafts. The high plateau of the north-east is a place of archaeological mystery, but the central plain is famed for its colourful traditions, its vibrant life, and the cosmopolitan atmosphere of Bangkok. 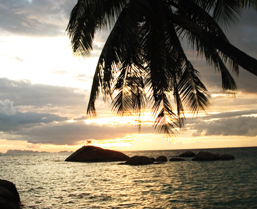 The southern peninsula is a place of idyllic beaches, unspoiled islands, and relaxation. Thailand has long been a migratory crossroads, and its 62 million people are a mix of ethnic Thai, Chinese, Malay and minority tribes, all of whom speak Thai and many of whom, in the holiday areas, speak English.